We’re all looking for ways to get more done every day, but the secret isn’t to find more time. Instead, find ways to manage your time better. 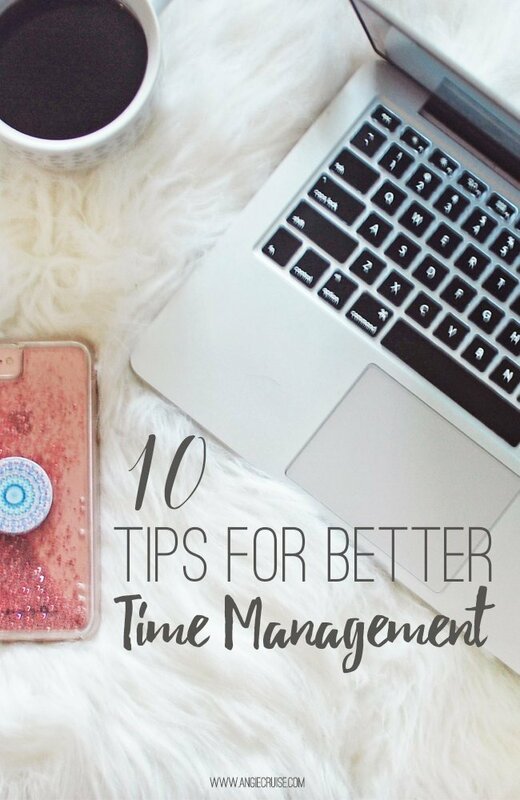 Today, I’m sharing 10 tips for better time management that can help anyone get more done. The last few months, I’ve really been struggling with my time management. I’m not really sure how it happened, but suddenly I’m struggling to get everything done on time. Blog posts aren’t getting published, deadlines are barely being met, and I realize at 6 pm that I didn’t pull out anything for dinner. It’s overwhelming, frustrating, and makes me feel like I just can’t get ahead. No matter what I do, my to-do list just keeps growing and I don’t have the time to complete it. The issue isn’t with my to-do list, though. The issue is with my time management skills. I know how to manage my time. I’ve been a business owner for the better part of a decade now, and time management is a skill I pride myself in having perfected. (Most of the time). Once I realized what the problem was, I sat down and wrote out all of my own favorite pieces of advice so I can remind myself daily what needs to be done. Almost every item on this list is something I’ve written about on the blog before, so I’m going to start taking my own advice. I plan to use this list as a way to get me out of my slump and back into my former productive glory, so I wanted to share it with you, too. When you’re feeling like you can’t keep up with everything on your to-do list, use this list to help you reclaim your time! Making the switch to a paper planner was probably the best decision I could have made for my productivity. The act of writing everything down in one place really helps me stay on top of my list. You can read about how I use my planner right here. This is great when you have to split your time between lots of different tasks, and can really help you cut down on distractions. Basically, you block out specific time in your day for each task. So, if you’re working on a project and remember that you haven’t checked your email, you know you’ll have time to do that later in the day. You can read more about how I time block in this post before you give it a try! This is one most of us are really bad at doing, and yet, it’s the most important one on the list! We can’t say “yes” to everything. When we do, we’re taking time away that could be spent on our priorities. I run everything through a filter of whether it supports my big goals. I ask myself, “If I do this, will it help me work towards this goal I made?” If the answer is yes, I’ll do it. If the answer is no, I most likely won’t. I talk about how important it is to learn to say “no” in this post! This goes along with learning to say no. When there’s too much on our plate, it’s easy to feel overwhelmed. This can go two ways. First, you want to prioritize the things on your to-do list. What is most important to get done today? What can wait until tomorrow? And even better, what can be removed from the list entirely? To figure out these daily priorities, it’s a good idea to also prioritize your big goals in life. We can’t focus on growing a huge successful business, keeping a spotless house, creating ever meal from scratch, homeschool our kids, and go to the gym every single day all at the same time. Not if every single one of those goals is a big change in your life. You’ll do much better by picking 2 or 3 goals and focusing on those until you’ve got them down! Want to read more about goal setting and prioritizing? Be sure to check out this post! I used to plan my day down to the minute. It was great, because I never had to think about what to do next. But what I eventually realized is that I wasn’t leaving any time for mistakes, traffic, or a project taking longer than expected. One wrong move, and my entire day would unravel. Now, I make sure to leave plenty of wiggle room in my day. It gives me more distraction-free time to focus on work, because I’m not worried about my current time-crunch. It’s so easy to get distracted bouncing from task to task throughout the day. When you batch similar tasks together, it helps create structure that allows for more focused work time. When you batch tasks, you’ll do all similar tasks at the same time. For example, you’ll check emails and social media at the same time, so that you get it all out of the way at once and can focus on more important things! As long as I can remember, I have always kept stacks of basic notebooks to use for notes, to-do lists, and anything else I want to remember. I got even more dependant on them when I started my blog. It is so neat to look back on everything I have written down over the last year to see how far I’ve come. My whole business is in these notebooks! In fact, a couple of weeks ago I was flipping through the first notebook I used when I started my blog. It was so neat to see the transition, and there were a lot of ideas I’d never used! It’s been 18 months, and I’ve still got ideas written down that I haven’t used. and notes from classes or books that I want to remember. It’s not neat and tidy like my planner. No one sees it except me, so it doesn’t matter what it looks like. It’s full of coffee (and wine) stains, torn pages, toddler scribbles, and very sloppy notes taken while I tried to keep up. I have quotes jotted in margins, names of courses or blog posts I want to remember, and encouraging messages to myself. If you’re not keeping a business journal, it’s a great way to stay inspired and motivated. I wrote about mine here if you want some more ideas! I’ve never been good at this. Recently, I decided on a whim to give it a try, though, and fell in love with how easy it made my days. Meal prep has really helped eliminate distractions for me, which gives me more focused time to work. It sounds counterintuitive, but multitasking actually makes everything take longer. I have to argue with my husband about this all the time. He prides himeself in his ability to multitask. I used to do it, too, but once I realized it was causing mistakes and making everything take longer, I made a concious decision to stop. Now I aim to focus on one thing at a time, and I find that my day runs much more smoothly! You can read a lot about how detrimental multitasking is all over the internet. I also talk about it in this post, which also has some more productivity tips for you! 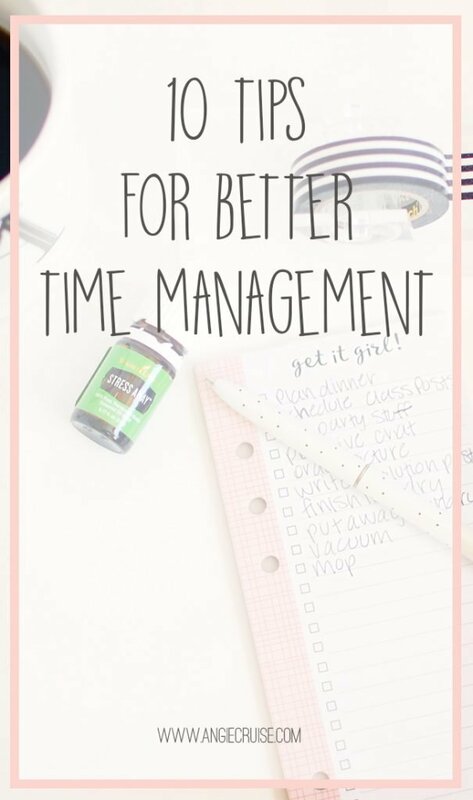 If you’re struggling with time management lately like I am, hopefully this list will help you get it under control! Want access to printables that can help you stay organized? Be sure to sign up here to get access!